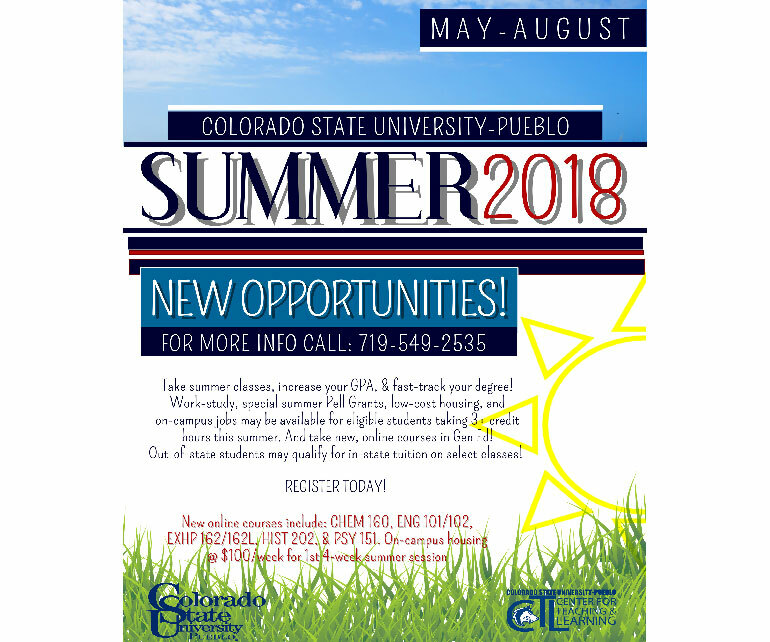 PUEBLO – New opportunities this summer at Colorado State University-Pueblo will allow recent high school graduates and current or transfer students to increase their GPAs or fast track their completion to a degree. Among the new opportunities this summer are more online general education classes, discounts for out-of-state students and residence hall lodging, and additional Pell Grants and work study funds. Special summer Federal Pell Grant funds are available for summer 2018, which have not previously been available. The U.S. Department of Education announced year-round Pell Grants will now be available. To be eligible for the additional Pell Grant funds, students must be otherwise eligible to receive Pell Grant funds for the payment period and must be enrolled at least half time (six credit hours). For more information, visit the Student Financial Services website at www.csupueblo.edu/student-financial-services/grants.html or contact Financial Aid Director Justin Streater at justin.streater@csupueblo.edu or 719-549-2753. Summer Task Force member and Executive Director of the Center for Teaching and Learning Dr. Donna Souder Hodge noted that students who spend summers on campus are more likely to graduate on-time and with less debt, which is why the task force sought to provide summer opportunities that would be attractive both to new and continuing students. Student work-study funds also are available for eligible students. In all cases, students must be enrolled for summer 2018 in at least three credit hours. Additional institutional funds have been side aside for more student hourly positions. Interested students and university departments can contact Souder Hodge in the Center for Teaching and Learning at 719-549-2290 or donna.souder@csupueblo.edu. The University has added six online general education courses to the summer school mix, some of which may be taken at a reduced tuition rate by out-of-state students. The new online courses include Chemistry 160, English 101 and 102, EXHP 162 and 162Lab, History 202 and Psychology 151. Many of these classes are gtPathways courses, meaning they are guaranteed to transfer to any higher education institution in Colorado. Resident students may register for these online courses in the usual manner, while out-of-state students should contact Derek Lopez at 719-549-2535 or derek.lopez@csupueblo.edu. Finally, summer school students will receive an automatic reduced occupancy rate of $100 per week in the residence halls during the first four-week session, May 14-June 7. In order to take advantage of this special offer, contact Gwen Young, director of Residence Life and Housing at gwen.young@csupueblo.edu.